For those of you who are forever wondering, I can genuinely report that I have had nothing but a positive experience working for the Trumps. Hello Huffington Post Makeup Readers! THE MOST important element to being a personal makeup artist to celebrities and high profile families is confidentiality! The moment you walk into their homes they must feel certain they can fully trust you to be themselves without you sharing these private moments with the world. I write this blog today without breaking this honor code of conduct, but rather to answer several repeated questions asked of me over the years and to share a few cute behind the scenes moments with this particular family. Upon arriving I am greeted by the kindest doormen/concierge and elevator men in all of NY, who graciously carry my makeup kit for me with their pristine white gloves into the elevator and up to the entrance of the Trumps' golden sky palace/triplex on the 66th floor which Donald, Melania and Barron Trump call home. The Trump triplex is for sure the royal palace of NYC. I never tire of their majestic golden "door" entrance, the crystal chandeliers, the marble floors, tables and bathrooms, the Renoir paintings and the panoramic floor to ceiling windows with views of my city that are the most supreme I've ever seen. For me it is a serene resting place to come and work high above the intensity and hustle and bustle of daily life. Surprisingly there is a peacefulness, a stillness to working there, even though undoubtedly you are in a kingdom. As hair master Mordechai Alvow of Yarok and I work our magic on this New York City princessa, Mr. Trump is usually at this time returning home from a long day "at the office." His first stop upon arriving home is saying hello to his beautiful wife. Mr. Trump and his wife Melania Trump are unequivocally, undeniably, unmistakingly perfectly suited for each other!!! I have always admired how well they get along, how they consistantly show respect for each other and how they stick up for one another! THEY ARE CERTAINLY A VERY HAPPY COUPLE!!! It is a pleasure to be in their company! Mr. Trump then dashes off to get himself ready for the evening event, which includes him doing HIS OWN HAIR!!!!! (I never work on Mr. Trump FYI, just the beautiful woman in his life) while I finish makeup and Mordechai finishes hair on Melania. Once we are done, she too goes to get dressed and we begin packing up our things to leave. At this time Mr. Trump, strikingly refreshed and ready for the red carpet sometimes returns to where we are and while waiting for his wife has been known to ask me questions such as, "So how did you enjoy flying in my helicopter last week to QVC?" Or "How did you enjoy flying in my airplane to the Oprah show?" 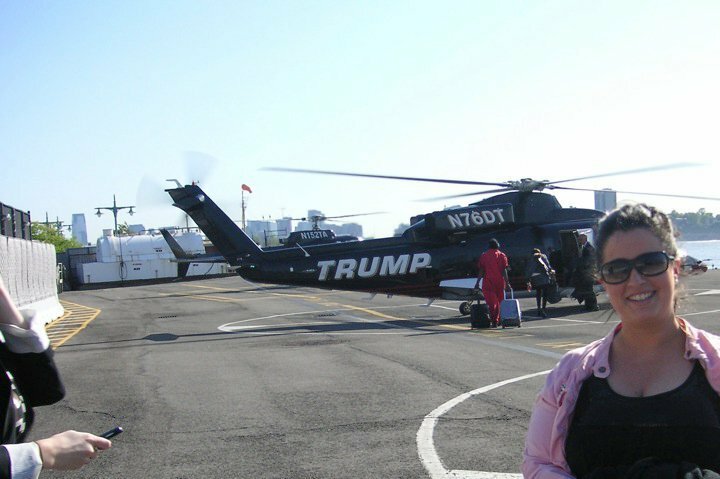 As I am a huge lover of private aviation I could chat with him about this ad nauseam but to these specific questions I truthfully respond, "Mr. Trump your helicopter is absolutely the best ride in town!" And... "I imagine that your airplane is the next best thing to Air Force One. 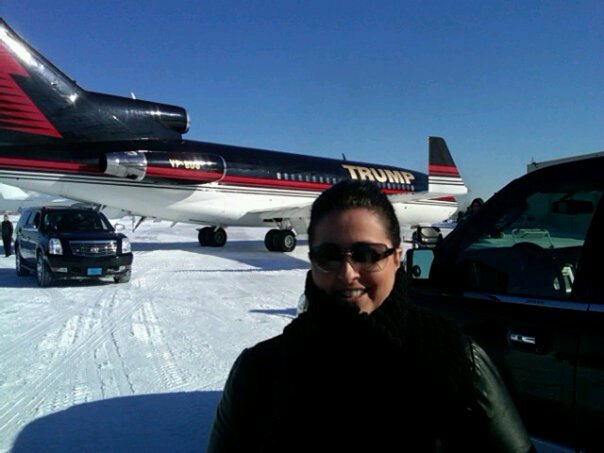 It's even cooler than the Gulfstream 5 jet which was the best private airplane ride I had ever experienced until having now flown on the Trump-mobile! I am seriously ruined for life. How will I ever be able to fly commercial again lol???" 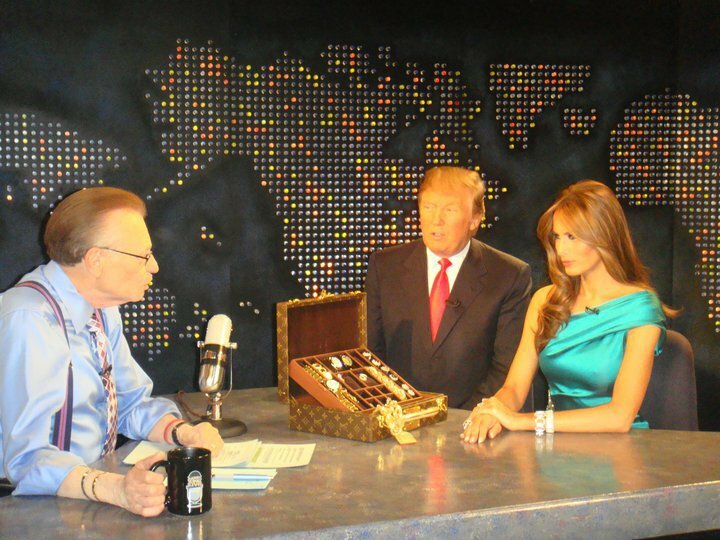 One time, after Mr. Trump and Melania had finished with a Larry King Live interview together at the CNN building in NYC, Mr. Trump turned to Mordechai and I and asked us if we would like to join him and his wife for dinner to try out the restaurant at his Trump Soho Hotel. Of course we were delighted to join and went with them to the restaurant. I must admit, it was pretty awesome walking into a Trump Hotel with the man himself. At dinner Mr. Trump was engaging in conversation. He asked me what my favorite makeup products were and why? Which brands did I think were cutting edge? He then proceeded to tell me that he thought I did a spectacular job on his wife and thanked me for my work which I thought was extremely generous of him to express out loud. He was fun, friendly and warm to those of us sitting at his intimate dinner table and, of course, attracted every celebrity in the place. At one point I believe even magician David Blaine made a cameo at our table to say hello. It was definitely a memorable evening for me. About Ivanka Trump? Simply put, she is a thoroughbred. The first daughter of New York, if you will. A drop dead gorgeous knockout! Clever, accomplished, HARD WORKING and totally dedicated to her family (all the Trumps are quite family dedicated actually, they are a seriously close knit family). Ivanka is undoubtedly the most well-spoken woman I have ever known. Her use of the English language is SUPERIOR and impressive and each time I work with her I somehow feel a mile smarter by the end of the day!!! She is a charming, elegant, no-nonsense, down to earth and cool kind of gal. For those of you who are forever wondering, I can genuinely report that I have had nothing but a positive experience working for the Trumps. They have always been generous and gracious to me. Media is media and it's spun in whichever way ratings and such need them to spin so think what you will about them, but I am here to tell you that on a human level The Trumps are first and foremost a family and actually have their act together more than most high-profile families I know. I wish them continued success and longevity and thank them for all they have contributed and continue to contribute to my life. Follow me on Facebook for all Nicole Bryl, Make-Up New York Photos.